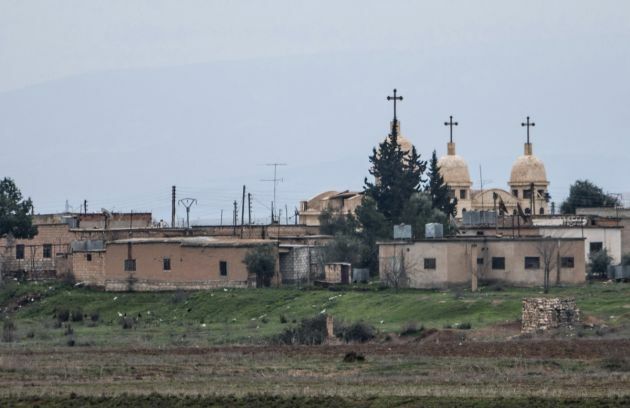 (Photo: REUTERS / Rodi Said)A general view shows a church in the Assyrian village of Abu Tina, which was recently captured by Islamic State fighters, February 25, 2015. Kurdish militia pressed an offensive against Islamic State in northeast Syria on Wednesday, cutting one of its supply lines from Iraq, as fears mounted for dozens of Christians abducted by the hardline group. The Assyrian Christians were taken from villages near the town of Tel Tamr, some 20 km (12 miles) to the northwest of the city of Hasaka. There has been no word on their fate. There have been conflicting reports on where the Christians had been taken. Although 23 Assyrian Christian hostages have been freed after ransom was paid to the Islamic State terror group, there are fears for fate of scores of others seized. The Christian Broadcasting Network reported that four more Assyrian Christian hostages were released March 4 from the more than 200 kidnapped last week in Syria. The Assyrian rights group Demand for Action and the Assyrian Charitable Association said that the reasons for their release were unclear. The group callings itself IS on March 1 had released 19 Christian hostages after they paid an Islamic tax imposed on non-Muslims. At least 190 Assyrian Christians remain captive. The group of 220 taken away in Tal Tamr, Syria last week. "Nineteen Assyrian hostages arrived on Sunday at the Church of Our Lady in Hasakah after they were released by IS," said Osama Edward, the director of the nonprofit Assyrian Network for Human Rights, in an interview with asianews.it. "They arrived on two buses from Shaddadeh," Edward added. Shaddadeh is a known IS stronghold in the northeastern province of Hasakah. The release had purportedly been decided by an IS tribunal on Saturday, ruling that families of each Christian must cough up a sum of money which it considered as "jizya," according to Edward. The jizya is a form of poll tax based on the Qur'an, which Muslims can impose on non-Muslims living in Islamic territories. Paying the jizya ensures the "protection" of non-Muslim residents, and they are not forced to convert to Islam as well. Assyrian officials and Muslim tribal chiefs began negotiating for the release of the hostages on Saturday. The IS are believed to control 10 Christian villages. The fate of the remaining 201 Assyrians are still undetermined, although other groups are continuing efforts to negotiate their release, according to another official of a nongovernment organization that is working with local tribes. "We're trying to contact any party that might help. We're working through our friends the tribal sheikhs," said Younan Talia, a senior official in the Assyrian Democratic Organization. "Some friends of Daesh [Arabic for Islamic State] are trying to send messages," he added, but so far, they have not received any feedback.